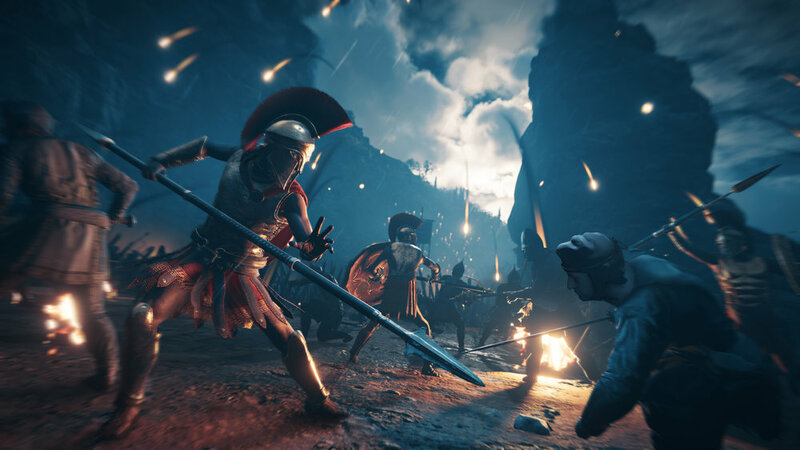 Ubisoft’s Assassin’s Creed Odyssey is shaping up to be an epic journey, taking the series to 5th century B.C. Greece. I previously wrote about my adventure in a late-game area with a beefed-up character, but I recently attended an event focused on the opening hours of the latest Assassin’s Creed. If there was one takeaway from everything the developers have ever said about Assassin’s Creed Odyssey, it’s that the game is all about choice. 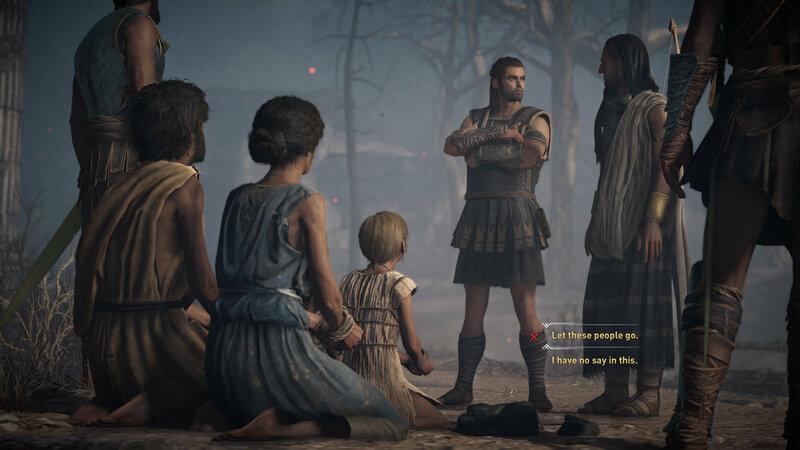 From my initial choice to play as either the male Alexios or female Kassandra, to my decisions of whom to help or kill, I felt empowered to shape the character into my own. This extends to defining the protagonist’s personality and building relationships with supporting NPCs, which lends a heavier role-playing aspect than in previous titles. I wasn’t just deciding whether or not to accept a mission. I could compassionately help someone or rudely chastise them. In fact, I could even rudely tell someone I’d help them. Nothing is black and white, nor is anything a “wrong” answer. Just because you’re kind to someone doesn’t mean they’ll reciprocate. The opposite also applies. Being a horrible person may pay off in-game at points. I personally convinced several NPCs that I was sent by the gods. Alternatively, I could have painted myself as a humble warrior, a proud liar, or a ruthless killer. I could even fall in love with certain people. There are over 30 hours if interactive cinematics that use the developers’ in-house dialogue system. I can only imagine the permutations of possibilities. 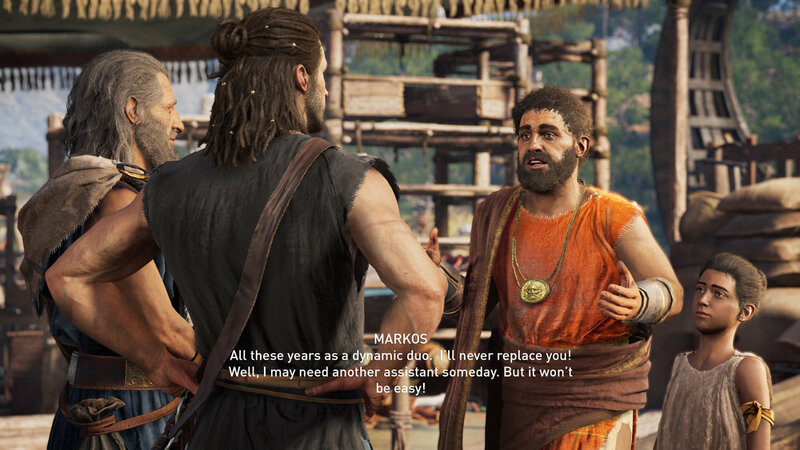 I played through the beginning of one of three principal story arcs that dealt with Kassandra’s family. I spent all of my time between two locations, Kassandra’s home island of Kephallonia and the war-torn Megaris. Following a brief introductory war sequence, I met the “business-savvy” Markos, who bought a vineyard with the very money that he owed me. Several missions on this tutorial island sent me on goose chases to hunt down money. As slow as it sounds, it was an effective way to introduce me to the game’s world and its basics. After choosing a horse, I rode around Kephallonia, seeking out missions and important locations. It’s worth noting that I played in Exploration Mode, which asks the player to seek their own targets of interest, as opposed to Guided Mode. It’s not too hard to scout any area thanks to your trusty eagle friend, Ikaros, who can hone in on cave entrances and crucial items. Kephallonia isn’t large compared to other areas of the map, but it feels vast, even on horseback. Consequently, I spent more of my limited playtime tackling the main quests rather than multiple sidequests. Most quests involved assassinating a target or locating a hidden treasure guarded by soldiers. The latter required me to utilize stealth, whether striking at long range with my bow or crouching in the bushes and quietly killing foes from the darkness. Of course, I could have chosen to go in, swords blazing, but getting caught even once usually spelled my eventual death unless I was careful. Nevertheless, some situations call for a more action-oriented approach and combat was fast and smooth. Parry enemies’ attacks and deliver an onslaught of your own. By leveling up, you can invest points into abilities, which include special attacks like a charging bull rush, a shield swipe, and yes, a Spartan kick, because how could that not be in this game? Abilities use up a refillable energy gauge, so I had to time my specials to effectively demolish my opponents. Some battles felt unbeatable, but as I gained levels by exploring and doing sidequests, I had access to better equipment. Some of the best progress markers are bounty hunters, who are set to hunt you down if you cause trouble within the region. These mercenaries are relentless and will actively interrupt your mission, sometimes sabotaging it by fighting you, often killing you if they’re at higher levels. You can remove bounties on your head by paying them off. Alternatively, you can kill the bounty hunters on your own. It was gratifying anytime I was finally able to take down a pesky hunter after hours of torment. My time in Kephallonia concluded with a confrontation with the Cyclops, who was less of a mythical creature and more of an eyepatch-wearing giant. It’s a fascinating take on the ancient Greek myths that balances history and legend. At the same time, it doesn’t downplay how intimidating the Cyclops is as a truly menacing man. Next I left for Megaris to seek out the Wolf of Sparta. Commandeering a boat, I engaged in the returning naval battles. As I detailed in my previous preview, naval battles were an exciting back-and-forth of firing arrows at enemy ships and evading their fire. I could also speed up the boat to ram them into oblivion. With many islands to explore, the boat will be a valuable asset, although traveling between areas sometimes felt dull, even with the naval battles. Thank goodness for fast travel! In Megaris, I encountered the Spartan army and chose to side with them against the Athenians. Assassin’s Creed Odyssey takes place around 430 B.C. during the Peloponnesian War, so this historical conflict was in full force. The structure changed slightly once I arrived in Megaris. My ultimate goal was to kill the Athenian leader. However, at my current level, it would have been very difficult, so the game encouraged me to lower the “Nation Power” by completing some subquests such as killing officers, burning war supplies, and collecting the national treasure. Doing so weakened the leader and allowed me to participate in the final act of the demo, the Conquest Battle. Conquest Battles are epic wars that pit two armies against each other. There are hundreds of soldiers on the battlefield, which makes it even more surprising how well everything performed. During the conflict, you are but one man or woman among many, and your role is to advance your troops and kill the opposing army’s hero. It’s on a grand scale compared to regular and naval fights, and it was a rush trying to survive while slowly decimating the battlefield. Conquest Battles are a perfect fit for the game’s context and scope. I won’t spoil the story elements, but there are a lot of great plot developments that left me wanting more. From a rich, open-world set in Greece to grand battles, this adventure is primed to advance the Assassin’s Creed series in big ways. Interested players can make their own choice when Assassin’s Creed Odyssey launches on October 5.